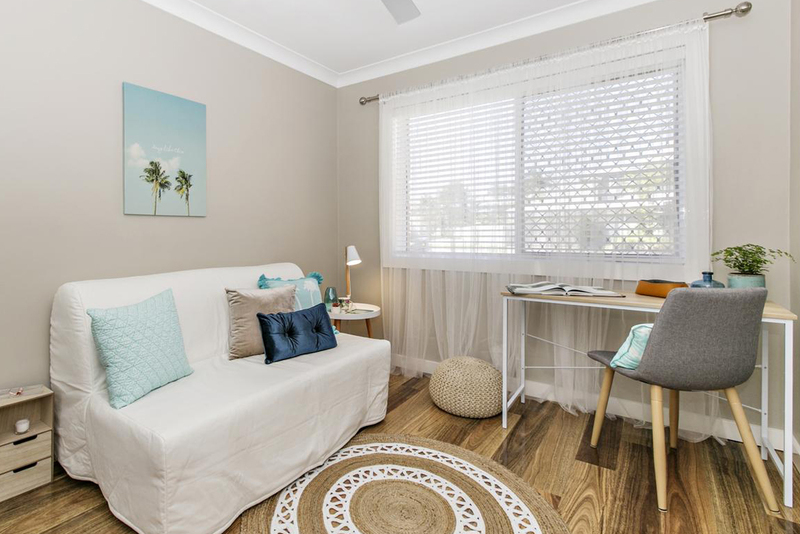 After completing their first renovation together as Cosmetic Renovations for Profit students Daniel and Melinda bought this Gold Coast unit a couple of doors down. 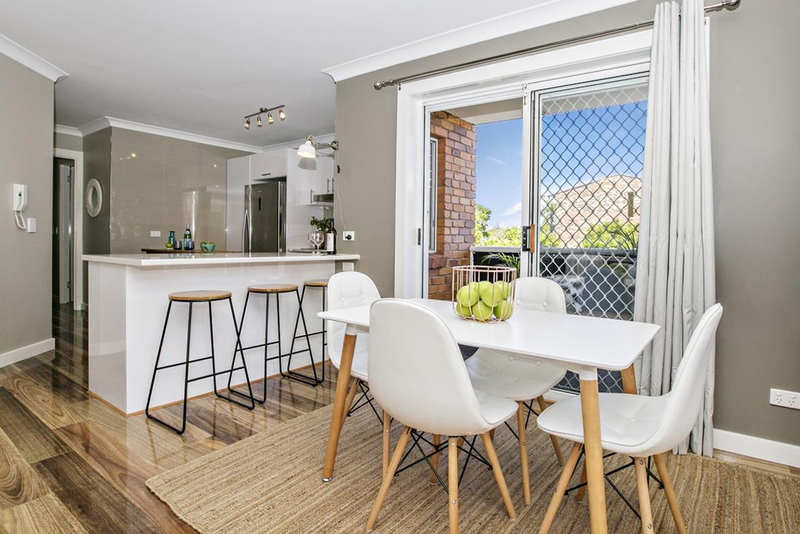 “We knew first-hand what renovated properties were selling for in our target suburb on the Gold Coast, so we pounced on this property the day it came on the market,” says Melinda. 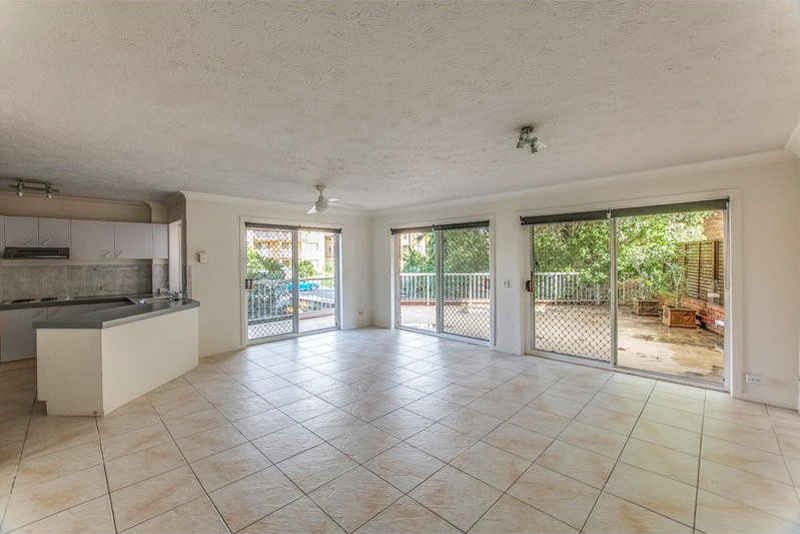 The tiles were all jackhammered up and “Spotted Gum” laminate flooring laid throughout. 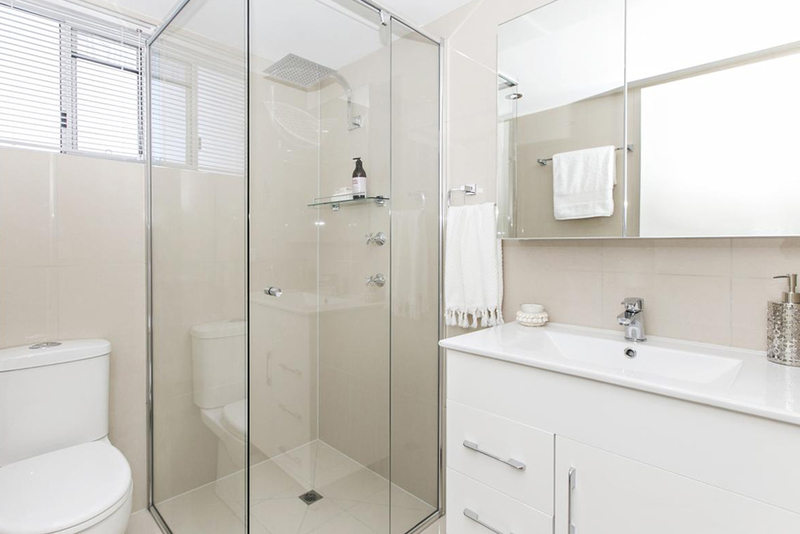 The unit ticked so many boxes and was clearly perfect for a cosmetic makeover. 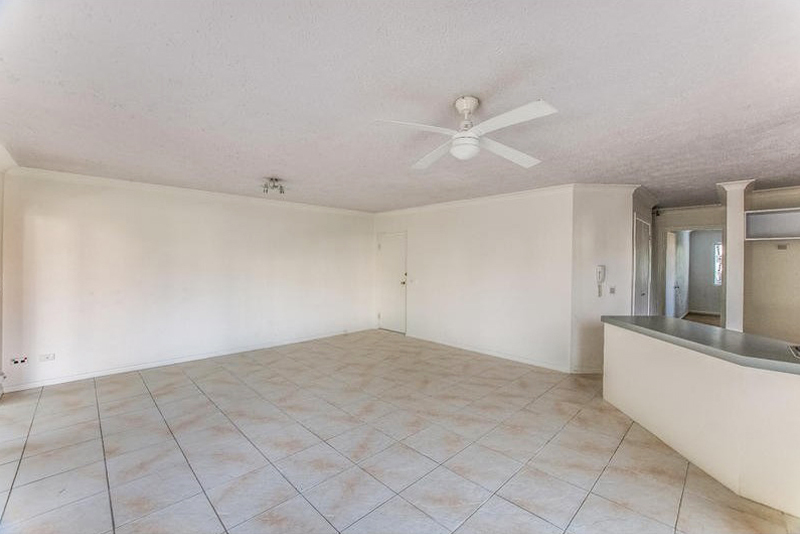 It had a great floor plan, an oversized patio and was just one block back from the beach. 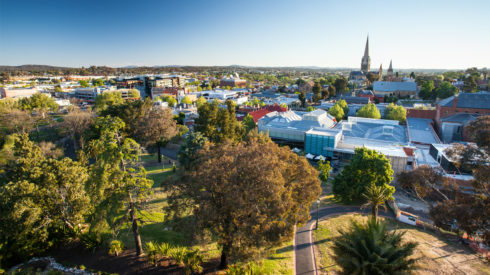 “It was located in a ‘gentrifying’ suburb, with a lot of infrastructure upgrades and new developments happening,” says Melinda. 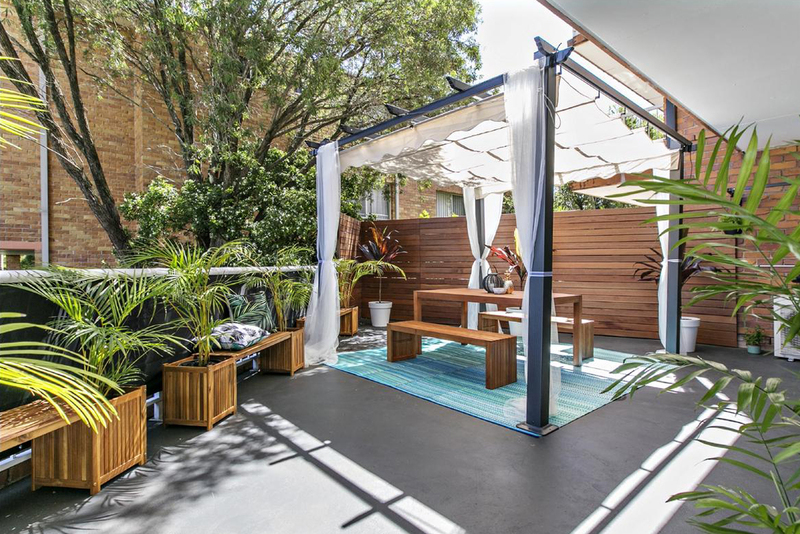 It already offered open-plan living, abundant natural light and an expansive 40 square metre entertainer’s terrace with private leafy outlook. On its doorstep was a thriving café, dining and retail scene, schools, a variety of leisure and recreational facilities, supermarkets and it was within easy access to public transport and the motorway. The property became their Principal Place of Residence (PPOR), thus avoiding capital gains tax, and they renovated it over a two-year period. 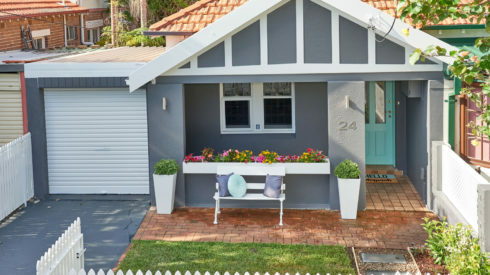 “Daniel broke his hand mid-way through and was out of action for a few months, which slowed down the DIY parts of the renovation,” says Melinda. 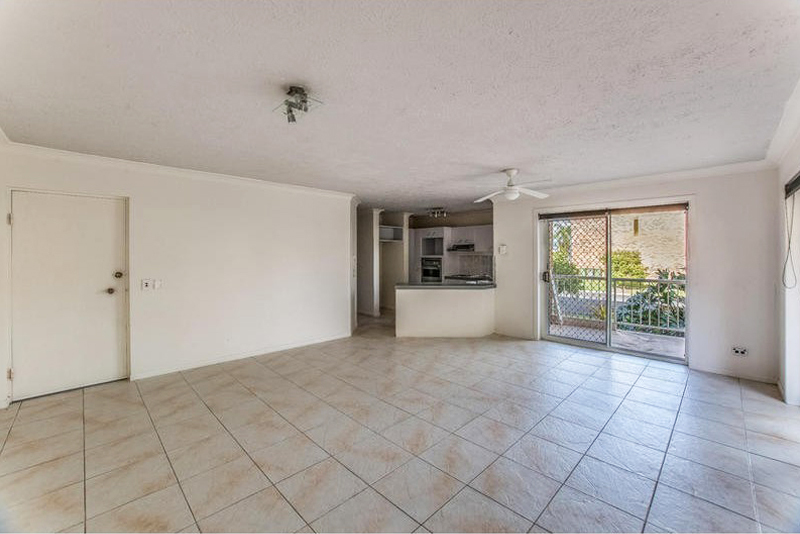 Jackhammered up the tiles, removed carpet and installed high-gloss “spotted gum” laminate flooring throughout. Removed dated “stipple” ceiling and re-plastered for a more contemporary feel. Used Cherie’s palette of colours to paint throughout. A darker shade of the main wall colour was used around sliding doors leading to outdoor area to frame the view onto the balcony. 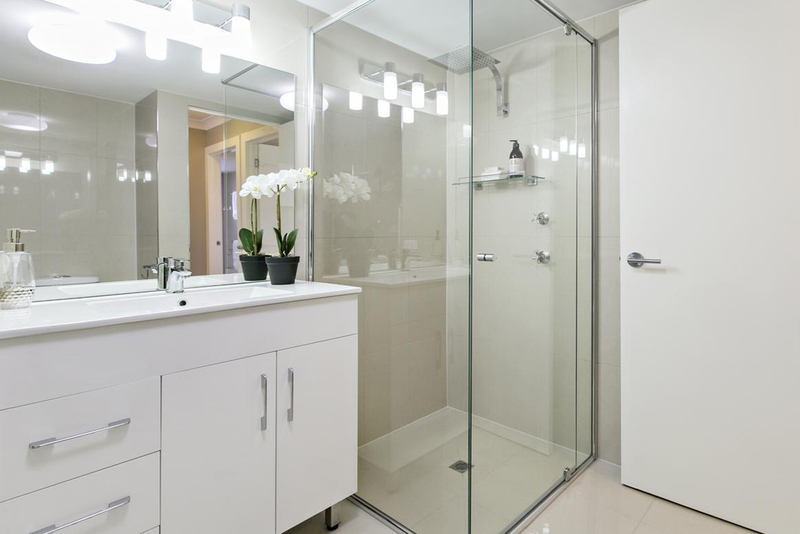 ​​Put floor-to-ceiling mirrored wardrobes in the two bedrooms. 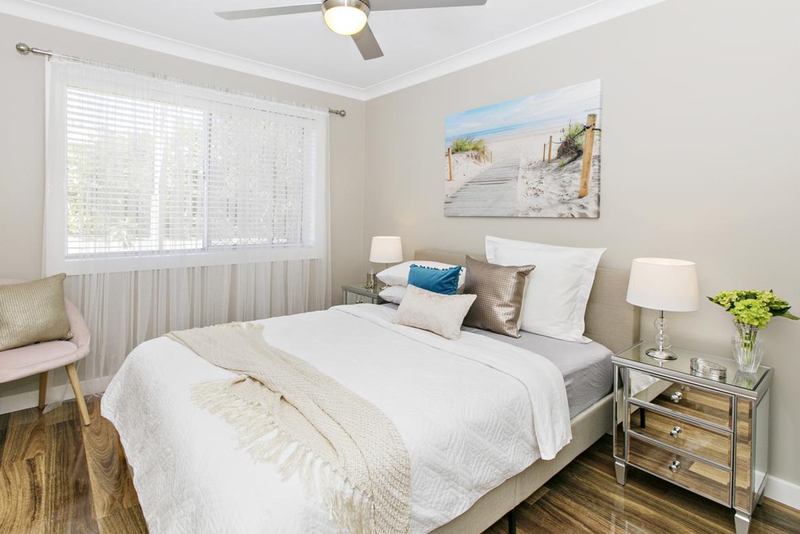 Installed ceiling fans in living room and bedrooms, and air-conditioning in living areas to combat the Gold Coast’s high humidity in summer. 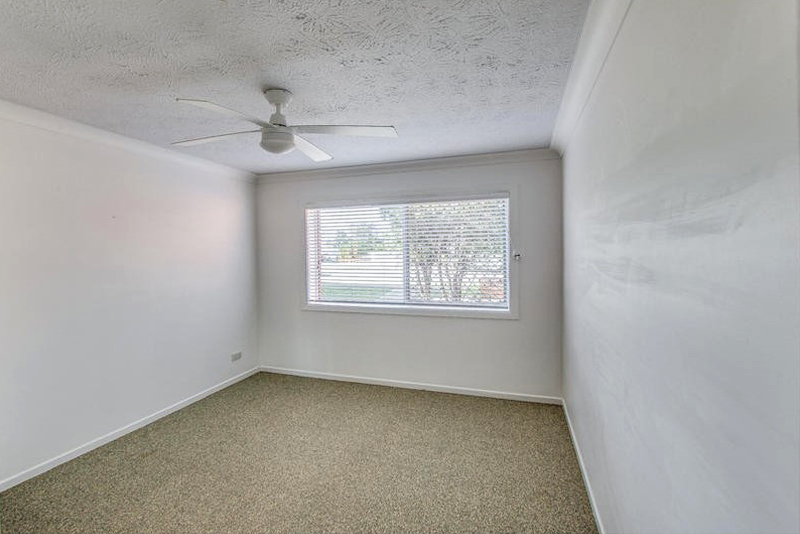 The second bedroom was styled as a multi-purpose study. 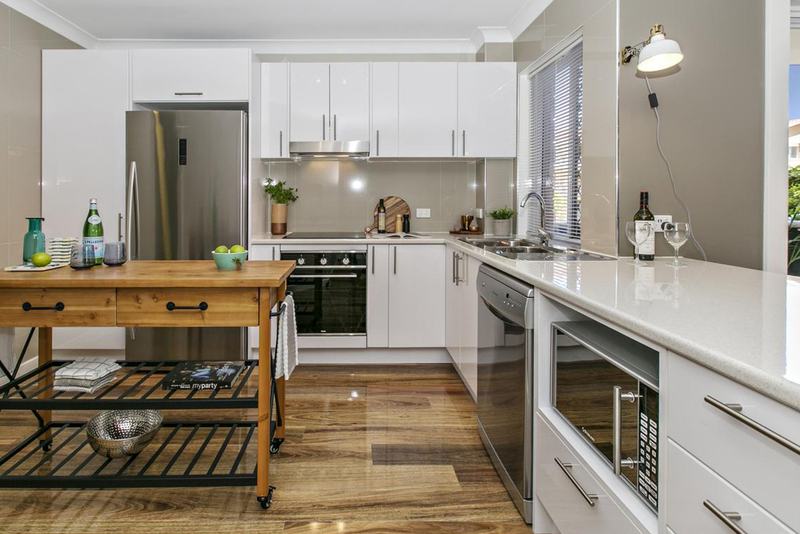 The open-plan kitchen is the focal point of the living space so the couple knew its renovation was pivotal to the makeover. 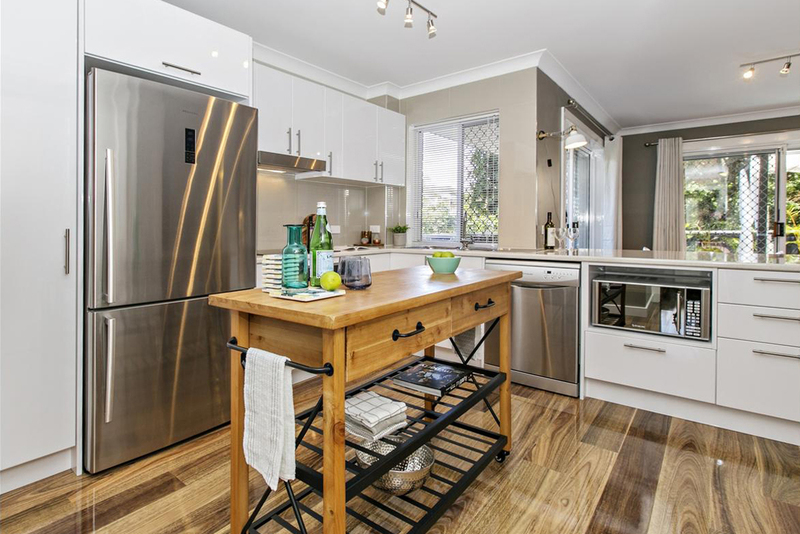 They decided to rejig the layout, removing the angled breakfast bar and cramped fridge cavity and corner pantry, introducing a more contemporary L-shaped kitchen. 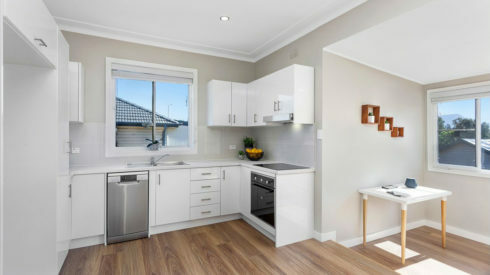 They installed a white, high-gloss Kaboodle flat-pack kitchen with soft-closing cabinetry, breakfast bar, feature lighting and shiny new appliances. The kitchen now feels a lot more integrated with the rest of the living space and less “boxed in”. The kitchen was completely reconfigured to make better use of the space. 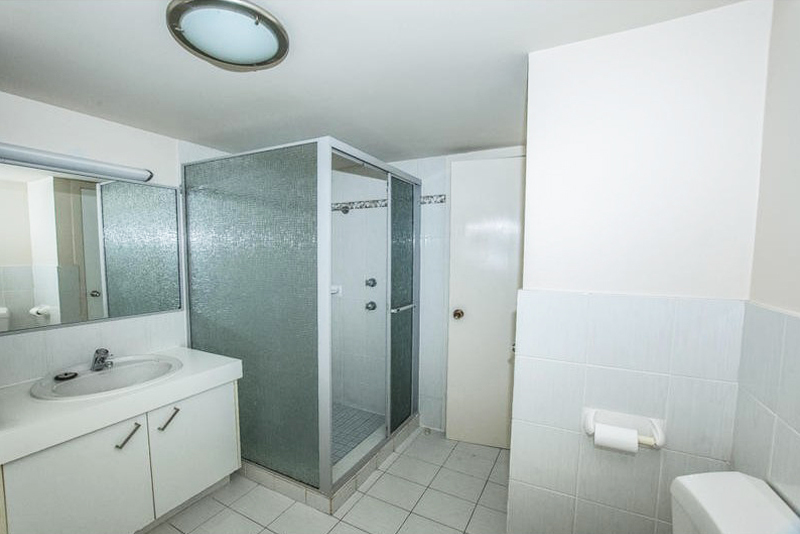 The unit had a main bathroom as well as an ensuite. These were both gutted, plumbing left in the same spot, and new fixtures, fittings and tiles installed. The feature lights were found at a clearance sale. 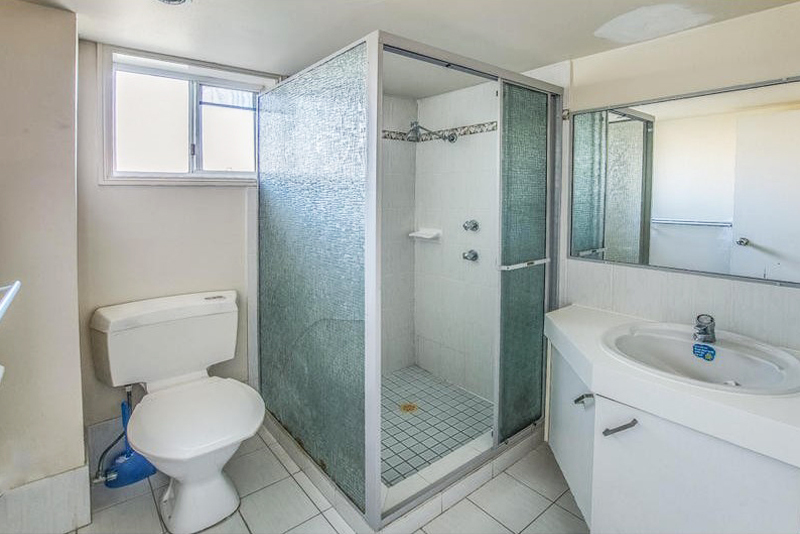 A laundry was integrated into the main bathroom. 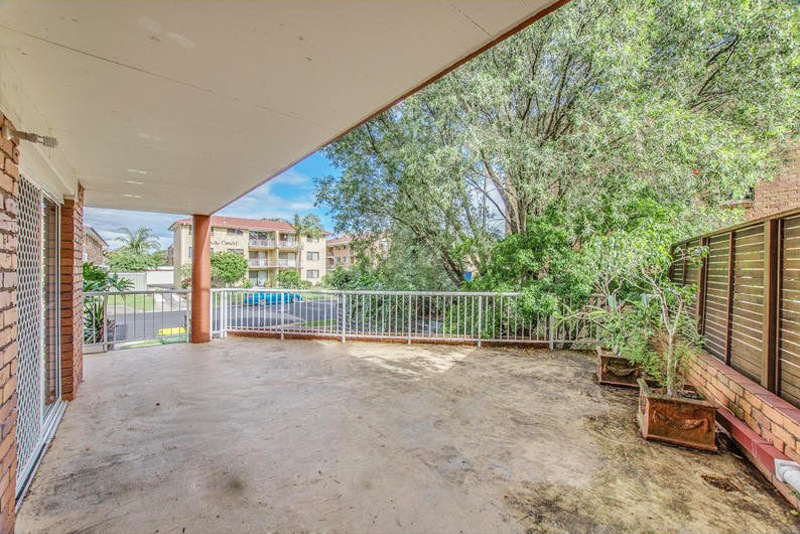 They also tapped into $38,000 of body corporate funds for general improvements to the apartment block. They had the roof re-pointed, sealed and painted; gutters and downpipes replaced; interior staircase painted; added a new garage door; new security intercom; and new turf and landscaping. 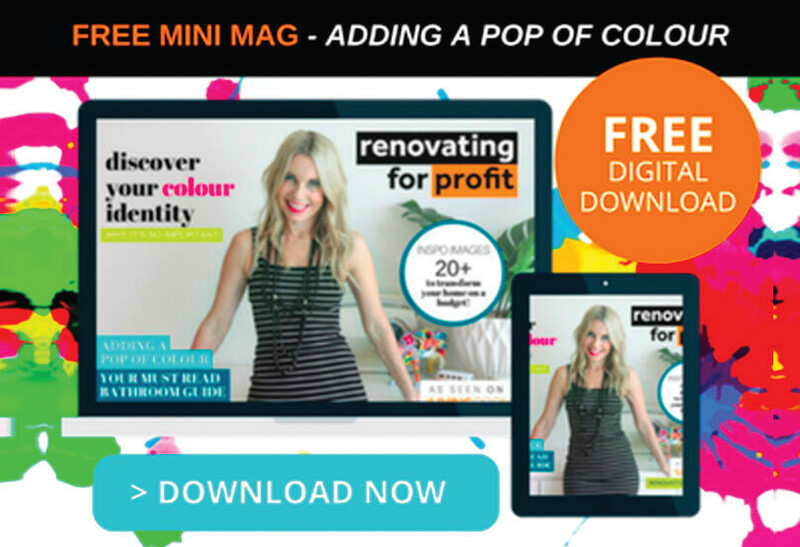 As well as completing the Cosmetic Renovations for Profit bootcamp together in 2015, the couple decided to do the Interior Design for Profit online course so they could style their own properties for sale. 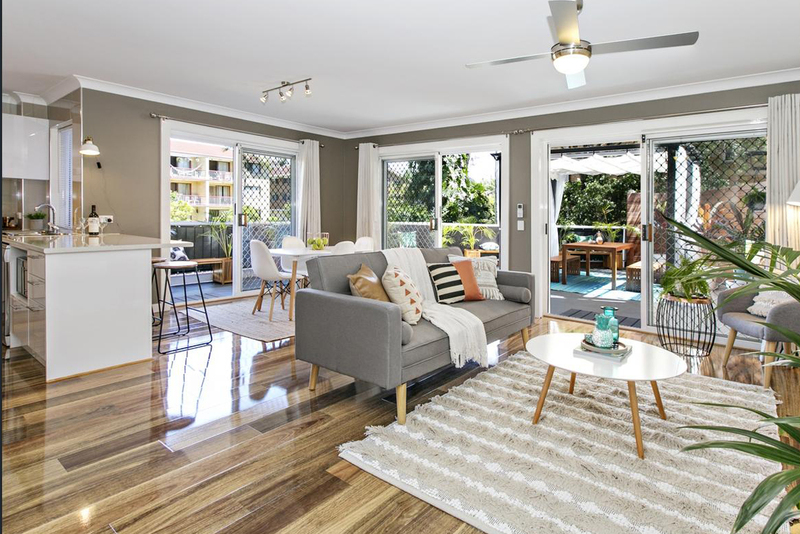 “We styled this property for a relaxed coastal lifestyle, with a strategically chosen colour scheme,” says Melinda. 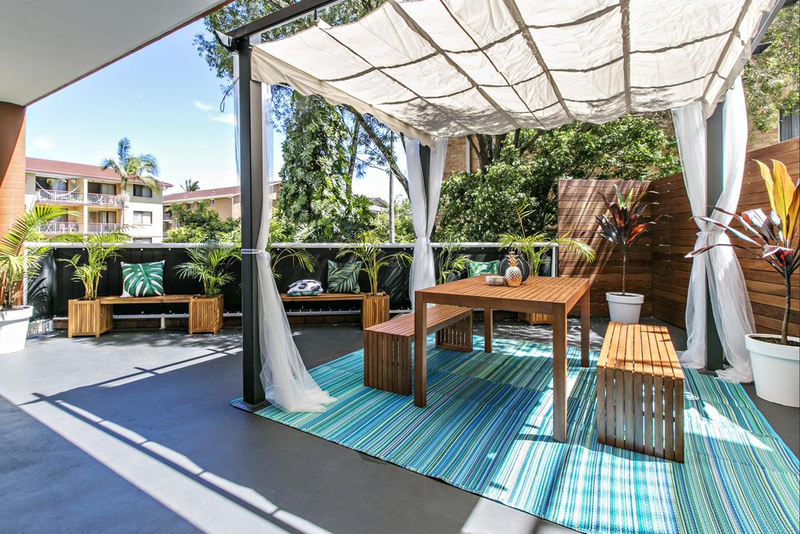 “An analogous [complementray] blue/green colour scheme was added to each zone, and pops of burnt orange/copper colours tie in with the warm timber tones of the flooring and outdoor privacy screen. 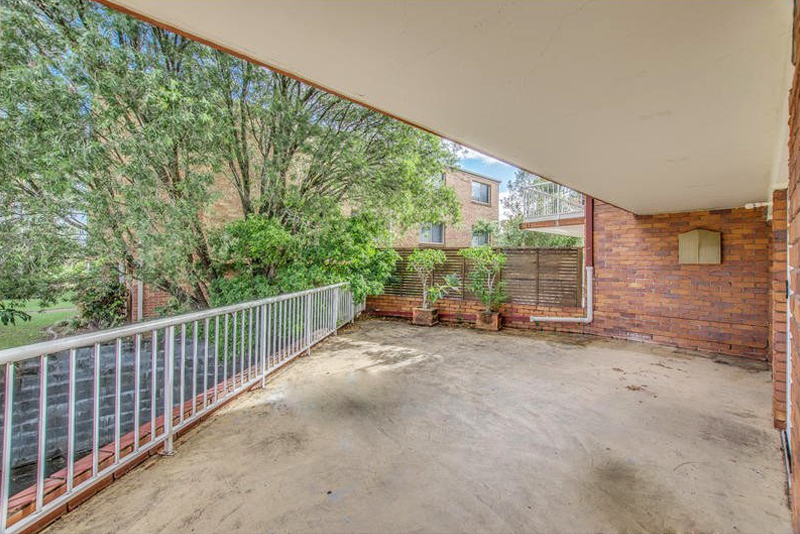 Never missing an opportunity, when the property valuer inspected the property on behalf of the purchaser’s bank, the couple were on site to show all the property’s features and also provided the valuer with their own valuation due diligence report using Cherie’s template. 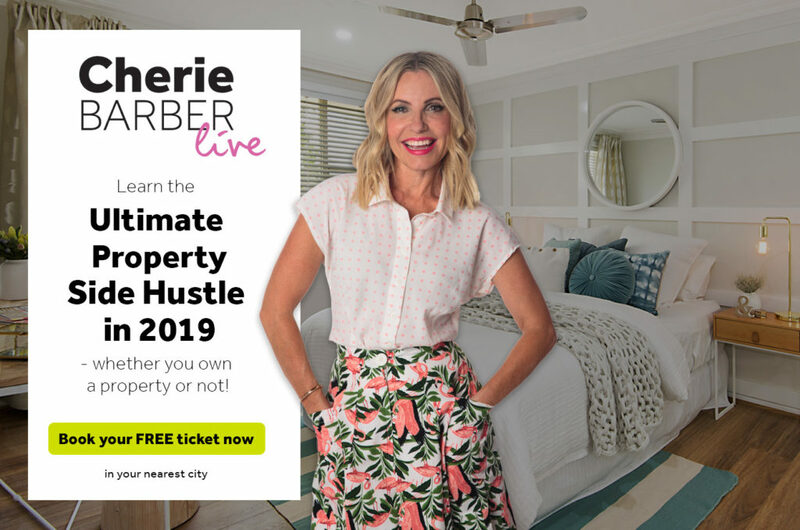 Daniel and Melinda have completed three projects together and have just purchased a property in Brisbane which they’re about to start work on.